Jewel Quest is the PUP that uses misleading techniques to prevent removal. Use Reimage to locate malicious components and get rid of them faster than with uninstall instructions. A full system scan blocks virus reappearance and prevents traffic to malicious domains. 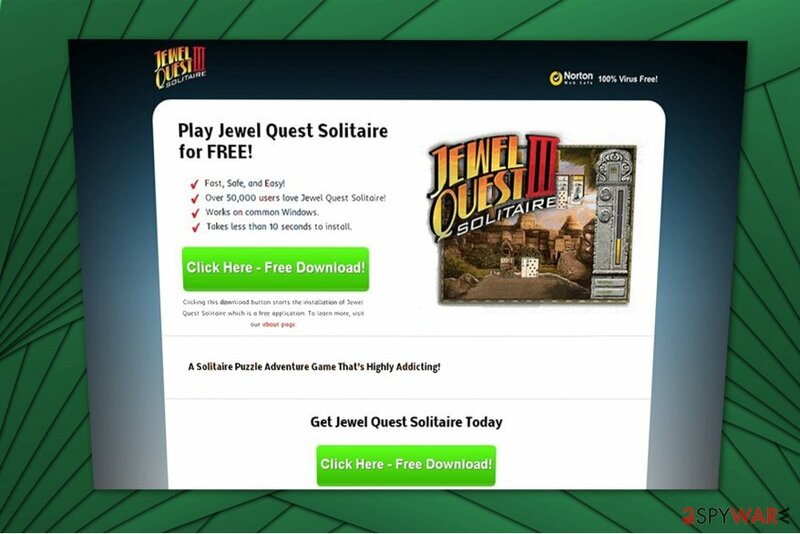 Jewel Quest virus is a bogus program which takes advantage of the highly beloved game. The adware program uses its name to benefit from inexperienced computer users who are not aware of the possible threats present in the cyberspace. This potentially unwanted program is particularly designed to generate revenue for its developers in not the most acceptable way. Users who install Jewel Quest virus receive tons of intrusive ads on their frequently visited pages. It is because the contrivers rely on the pay-per-click marketing scheme and try their best to bring more traffic to the affiliated websites by promoting less than reliable ads. Since they might look genuine and innocent, you can recognize them by “Ads by Jewel Quest” distinction. Despite how attracted you are to click on them, we recommend you to rethink that again. Pushed ads might either lead you to suspicious sites where malware is distributed or infiltrate computer threats itself. Likewise, do not click on them and remove Jewel Quest ads now. You can get help from the manual elimination guidelines below or employ a professional security software. If you still believe that Jewel Quest is not malicious, be aware that it collects various information to deliver those annoying ads. This data might be personally identifiable and include such details as your name, surname, email address, location, etc. Jewel Quest adware is a potentially unwanted program which targets to flood users with intrusive ads. Hackers use this data to not only create customized ads which have a better chance to lure you into clicking on them, but also sell it to third-parties or misuse in another way. For example, you might start receiving spam emails or scam alerts designed for phishing purposes. Therefore, Jewel Quest removal is the best option to protect your privacy and get rid of annoying advertisements. For that, we strongly recommend using Reimage since it can eliminate the adware within seconds and ensure your computer's security in the future. This potentially unwanted program might sneak into your computer when you carelessly install regular applications. It is because the contrivers hide their unreliable applications inside software-bundles. In other terms, they might bundle their product with free programs and offer both of them as one. If you want to stay safe, you should pay attention to the installation/download process and avoid letting adware in. The information about this PUP might be either hidden if you choose Quick or Advances settings of the installer or you might get confused when you see “Get Jewel Quest now!” mark. Naturally, people will link this adware to the famous game and do not de-select the checkmark which allows installing the potentially unwanted program. However, we want to warn you that this is merely an attempt to benefit from the legitimate game. However, whenever you decide to install a free program, you should do a small research about it and only then start the installation. Most importantly, always select Advanced or Custom installation option and carefully monitor the entire installation process. Experts from DieViren.de suggest you concentrate on finding additional components, such as add-ons, plug-ins, toolbars, and extensions that you certainly do not want installing and make sure to un-mark them. While Jewel Quest virus disguises under the name of the popular game, it might be hard to detect it. You can either remove the original files or damage your computer in other ways. Therefore, we strongly advise you not to try to perform Jewel Quest ads removal without any assistance. Either go to a certified IT technician to fix your computer or employ a reputable security software. You can pick one of those below and run a full system scan. It will help you remove Jewel Quest ads quickly. Additionally, those who feel advanced enough can use the manual elimination guide which is attached at the end of this article. However, it is essential to understand the risks which might come if you skip steps or misinterpret the instructions in another way. Likewise, be careful and make sure you follow each step attentively. If you want to clean Windows from any potentially unwanted programs, it is vital that you remove their components as well. Here, look for Jewel Quest or any other recently installed suspicious programs. Wait until you see Applications folder and look for Jewel Quest or any other suspicious programs on it. Now right click on every of such entries and select Move to Trash. When in the new window, check Delete personal settings and select Reset again to complete Jewel Quest removal. Once these steps are finished, Jewel Quest should be removed from your Microsoft Edge browser. Here, select Jewel Quest and other questionable plugins. Click Remove to delete these entries. Now you will see Reset Firefox to its default state message with Reset Firefox button. Click this button for several times and complete Jewel Quest removal. Here, select Jewel Quest and other malicious plugins and select trash icon to delete these entries. Click Reset to confirm this action and complete Jewel Quest removal. Here, select Extensions and look for Jewel Quest or other suspicious entries. Click on the Uninstall button to get rid each of them. Now you will see a detailed dialog window filled with reset options. All of those options are usually checked, but you can specify which of them you want to reset. Click the Reset button to complete Jewel Quest removal process. ^ The Danger of Pop-ups. SpamLaws. Pulling the Plug on Internet Imposters. ^ DieViren. DieViren. Security and Spyware News. This entry was posted on 2017-12-13 at 10:23 and is filed under Adware, Viruses. You can quickly scan the QR code with your mobile device and have Jewel Quest adware manual removal instructions right in your pocket. How did you remove Jewel Quest adware?